Who says August's the quiet month for news? Here in the UK, riots revealed the worst and best of social media: large-scale looting was organised at least in part via secure Blackberry Messenger, while large-scale clean-ups were enabled through Twitter hashtags. Watching criminals exploit the privacy of BBM was as depressing as the relief felt from watching the publicly spirited clean-up. All a strong reminder that social activism through social media and messenger tools will be a permanent feature of society from now on whether in Libya or London. Digital media battle lines continue to shift, as Google became a fully-fledged mobile maker after the Motorola acquisition, and a fully-fledged TV platform with the UK announcement of Google TV. Facebook got serious about location, dropping 'Places' for a universal location tagging system, adding mobile messaging in its bid to stifle Twitter and FourSquare, and ramping up its privacy along the way. On a sad note, Apple lost its 'rock star nerd', as Steve Jobs stepped away from the helm. Jobs is a true digital revolutionary who pioneered game-changers like the iPod, iPhone and iPad - a real icon of our times who has materially affected all of us. While Apple's strategy looks confident to continue, we're still unconvinced by the shock moves at heavyweight tech firm Hewlett-Packard to ditch mobiles, tablets and PCs to become a standalone software maker. US online radio station Pandora has revealed its advertising is now generating more revenue per 1,000 hours of airtime than traditional radio is doing right now.Pandora posted revenues of $67m for the second quarter; more than double 2010's figures. This comes from its desktop version, and its mobile service has more room for growth. Analysts have pointed out that its ratio of revenues per hour are higher than that of traditional radio stations. Google is set to bring its web TV service to the UK before February next year, the company has announced. Launched earlier this year in the US, Google TV lets viewers switch between television and the web on the same set. UK viewers will have to buy a Google TV set top box, or special TVs with the service built in. Viewers can watch material from catch-up services such as BBC iPlayer and ITV Player on their main TV screen. Channel 4 is ramping up its audience targeting capabilities in a bid to attract more advertisers to its websites. The broadcaster is enticing viewers to enter their preferences in exchange for exclusive online shows, with the data added to a central database for managing viewer information. Steve Forde, a digital marketing specialist at Channel 4, is moving to become head of viewer relationship management. Budweiser is to broadcast the FA Cup first round match between Ascot United and Wembley FC on its Facebook fan page, marking the first live broadcast of any sport on the social network. The move will put the non-league sides in front of a potential audience of 700 million this Friday night. FA Cup sponsor Budweiser brokered the deal with the teams. Facebook said that the live stream is not sponsored by, endorsed by, administered by or associated with the social networking website. The popular Horrible Histories books and TV series have been brought to life in a new virtual world, created for Scholastic by social media agency, Yomego. Horrible Histories World - the first virtual world launched on the new platform from Yomego’s sister company, HuzuTech - opened on 1 August, with a full launch planned in September. During ‘prime time’ hours, smartphone owners browse the internet on their mobiles and watch TV at an equally high rate of usage, according to new research. An analysis of madvertise’s 1.4 billion monthly page impressions (which make it one of the farthest-reaching mobile networks in Europe) found that more and more users are surfing the internet with smartphones. In particular, the analysis concluded that smartphone users are watching television at the same time as surfing the internet on their mobile devices. Social Participation TV (S P-TV) will drive interactive behaviour to generate $2.9bn globally by 2016, according to a new report looking into the converging worlds of mobile devices, social media and interactive TV platforms. Mobile and digital technology business Mobile Interactive Group (MIG) today released a major research white paper on the trends and opportunities in participation TV (P-TV) services in particular social channels across global markets. People are demanding more quality and connectivity from their mobile phones and other devices… and are ready to pay for it, according to new research. Amdocs, a provider of customer experience systems, has announced the results of a global study that provides unprecedented insights into consumer behavior and attitudes as we move into the connected world, particularly that consumers are prepared to pay a premium for increased connectivity and quality of service. Google is turning to TV advertising as it seeks to drive up awareness and usage of its products in India. The search giant is adapting an idea already used in several other countries, and utilising the tagline "The Web is What You Make of It", specifically for Indian consumers. India constitutes a particularly attractive market for the company, given the size of its population, alongside rising internet penetration and digital literacy levels. Mobile music discovery firm Shazam has raised $32m in new funding led by Kleiner Perkins Caufield & Byers (KPCB) and Institutional Venture Partners (IVP), with existing investor DN Capital participating. The investment will be used to support the company’s continued growth and the development of Shazam’s real-time discovery and sharing App which creates an engaging, interactive mobile commerce platform for brands as it expands into television with Shazam for TV. ITV has launched its catch-up TV service ITV Player for Android, with plans to launch on the iPhone making later this year. Viewers can watch all ITV programmes of which the rights to show on mobile are cleared, for up to seven days after broadcast. ITV Player works on Android mobile and tablet devices that run Android 2.2 (or higher), Adobe Air 2.6 (or higher) and are connected to wireless internet. The BBC has launched its BBC News product for connected TV which will bring video news clips via the web to living-room TV screens. The BBC News product for connected TV combines existing video and text content from BBC News Online and will initially be made available on Samsung's range of Smart TVs. It will subsequently be made available on a range of connected devices over time. 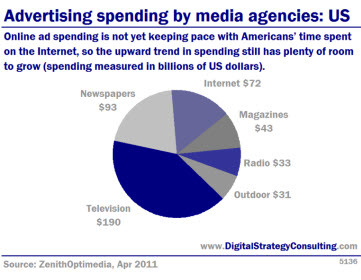 Online ad spending is not yet keeping pace with Americans' time spent on the Internet, so the upward trend in spending still has plenty of room to grow (spending measured in billions of US dollars). 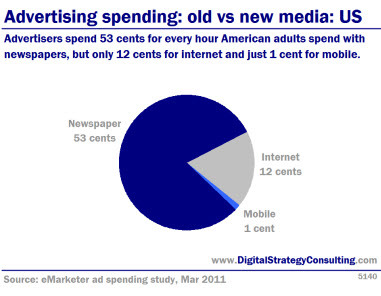 Advertisers spend 53 cents for every hour American adults spend with newspapers, but only 12 cents for internet and just 1 cent for mobile. Argos has launched its own home shopping channel this week on Sky and online. The channel will act as a shop window for the retailer, showcasing more than a thousand products a week with in-depth demonstrations. It will broadcast 24 hours a day, seven days a week, and can also be viewed on the Argos website. The French government is set to ban the use of the words 'Facebook' and 'Twitter' on television or radio programs, after a crackdown on using brand names on news programmes. According to a report in the Daily Mail, President Nicolas Sarkozy's colleagues have agreed to uphold a 1992 decree, which stipulates that commercial enterprises should not be promoted on news programs. Broadcasting anchors would be forbidden to refer to the popular social networking site and the microblogging phenomenon, unless it is relevant to a news item. Google has broadcast its first advert on UK TV, during the Champions League Final last weekend. The advert promoted the firm's own web browser, Chrome, using an advert that has been previously seen in the US as a father documents the life of his daughter. Google's advertising in the UK has until now been limited to billboards and posters but the new 90 second prime time advert shows the firm is serious about capturing additional market share for Google products and services. The advert shows the girl's father recording the life of his growing daughter using a variety of Google services including Gmail, YouTube and Google Maps. Viewers pay more attention to online video ads than to TV commercials, and have better product recall, according to a new study. The research, from video ad network YuMe and IPG Media Lab, measured the reactions of 48 viewers watching one hour of programming. Using facial tracking algorithms and biometric monitoring, a second-by-second monitoring of cognition, excitement, and stress found that despite constant distractions in both mediums, online video commands higher attention and recall from viewers. As part of a new Government-backed report, Professor Ian Hargreaves has made 10 major recommendations to free-up restrictive intellectual property and copyright laws that "obstruct innovation and economic growth in the UK". The 123-page report found that businesses aiming to take advantage of opportunities in areas such as the internet are being held back by often archaic laws. The Hargreaves report, the result of a five month review, recommends legalising the practice of copying music and films and seeks to relax the rules around 'transformative works' - reworkings of existing content. It also calls for a new agency to mediate between those wanting to license music, film and other digital content and rights owners.